Although we will always endeavour to send our surveyor to assess the site before anything can be installed, it would help greatly if you could prepare a couple of things before you visit. Firstly, a photograph of the area you would like us to install the fire or fireplace, preferably from as far away as is realistically possible. It need not be printed just bring the device ie camera you took the picture on. Secondly, any relevant measurements that may help you while you browse. We don't need a work of art or a scale drawing as you will see from our notes pictured! 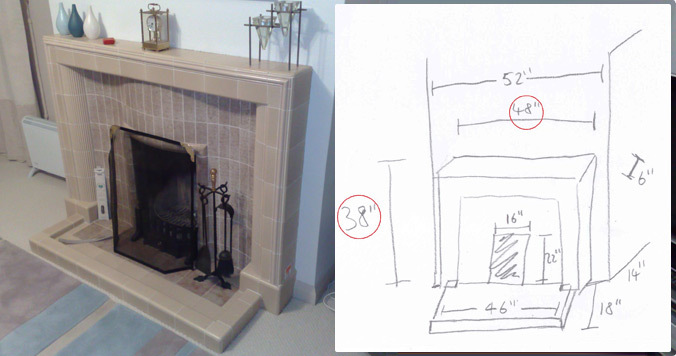 Useful dimensions can be, (Fig.1) the width and depth of the chimney breast (if your property has one), (Fig.2) the width and height of your existing surround (again, if you have one) and (Fig.3) the opening within your fireplace for your fire (again, if you have one and if there is not something blocking it). If your chimney is on the outside of the house then a picture is usually unnecessary but the width and depth can still often be helpful. If you cannot do any of these things do not panic, they are just the type of thing we will do on the survey. The advantages to doing it before you visit are that it can save you choosing products that are not suitable. It also enables us to give you a more accurate estimate in the showroom if we have this information.